Sam’s passion for furniture making stemmed from his father (who also owned a furniture company) and whilst growing up, Sam spent many a day tinkering in his father’s workshop mastering the craft of wood work. 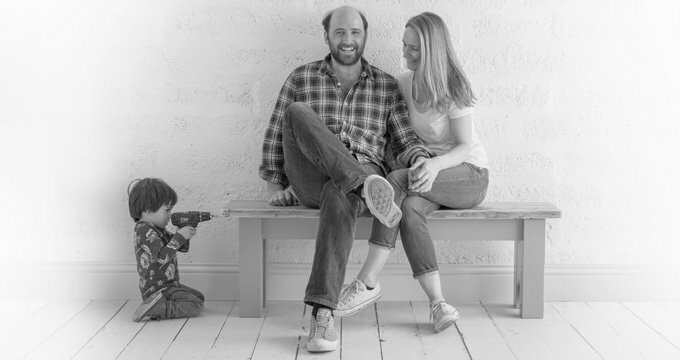 In 2013, following an unusually exciting career skippering large yachts for the wealthy and driving boats for Hollywood movies, Sam decided it was time to settle down and embrace family life in Devon. Whilst working on his home renovation, Sam was on the lookout for a well designed, good sized kitchen table that had a pop of colour. On struggling to find such a table, he decided to make his own. With friends and family commenting on how much they loved the table, Sam started to make a few more and they sold well and the business grew into what it is today. Our office and admin is fronted by Sam and Tania where you will receive a personal service, from help in choosing the right tops to selecting difficult colour combinations. Why not make an appointment to come and view our workshops and see our tables being made? Based in the foothills of Devon, our workshops are a hive of activity. Our aim is to supply you with the piece of furniture you want - in any size and any colour. This aim is backed up with impeccable customer service and after-sales. We are a small but growing business so every effort is made to ensure our customers receive the best possible support before and after any purchase made with us. In the workshop we have five very skilled and creative Devonians working on all of our collections, it is a very close unit we run and this means products get the best possible attention and care. We can all turn our hands to new and different projects often using traditional methods to give each piece its own unique and natural handmade look. There’s a good buzz in our workshops and we welcome customers to swing by any time to see what we do. If you'd like to see the tables before you buy, please get in touch to make an appointment to come and visit us at the workshops.